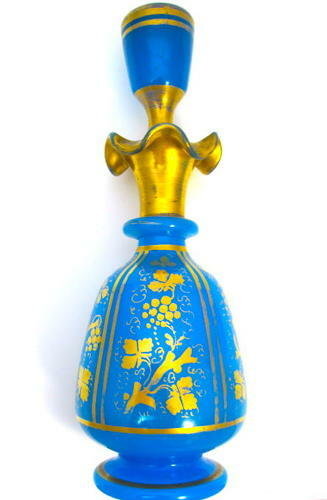 Large Antique Baccarat Blue Opaline Glass Perfume Bottle with Gilded Vine Leaf Decoration and Undulating Rim. Wonderful Rich, Deep Blue Opaline Glass (Blu Drapeau). See Page 159 'Les Opalines' by Christine Vincendeau for and Examples of the Similar Perfume Bottles.